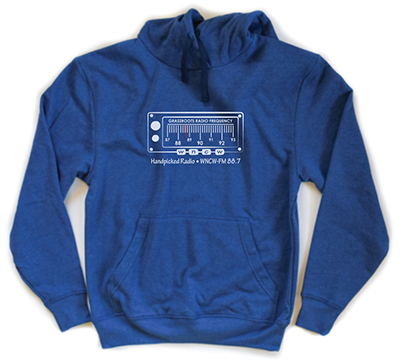 The latest WNCW Hoodie is a blue Recover Brand pullover with a radio dial on the front with "Handpicked Radio - WNCW-FM 88.7" below the graphic. The graphic imprint is light blue. WNCW's logo is on the back. Click here to continue looking at more Thank You Gift options.